URSA Broadcast is two cameras in one, an incredible field camera for ENG and programming work, as well as a professional studio camera. Introducing URSA Broadcast, the world’s most affordable and most flexible professional broadcast camera. URSA Broadcast is two cameras in one, an incredible field camera for ENG and programming work, as well as a professional studio camera. URSA Broadcast is perfect for traditional broadcasters because it uses the lenses and batteries you already own, and it also eliminates weird media cards and file formats found on traditional cameras. It records onto regular SD cards and uses the same common file formats found on broadcast media management systems and most NLE software. Plus URSA Broadcast is perfect for web broadcasters because it works with both older after market HD lenses and inexpensive photo lenses. No other broadcast camera is more flexible and more affordable. URSA Broadcast is two cameras in one. The compact design, familiar controls and broadcast camera features are ideal for ENG style shooting and vital for working quickly when you’re trying to capture breaking news. Whether you’re in the studio or out in the field, URSA Broadcast will give you incredible image quality, accurate skin tones and vibrant colours that are far superior to cameras costing ten times more. The key is URSA Broadcast's new extended video mode that produces pictures you don’t need to colour grade so you can shoot, edit and get stories on air faster than ever before. URSA Broadcast is also the first camera that finally lets AV and web broadcasters afford a true professional broadcast solution that’s dramatically better than DSLRs. URSA Broadcast is the first professional broadcast camera designed to work with standard media cards and file formats that are compatible with virtually all broadcast systems and editing software. URSA Broadcast records onto inexpensive standard SD cards, UHS-II cards and CFast cards, and records 1080i or 2160p video into standard .mov files, with .mxf to be added in future updates. URSA Broadcast records using DNx145, DNx220X or ProRes so the files will work with your existing broadcast systems and workflows. You also get a B4 lens mount that works with your existing lenses, or you can swap it for optional EF, F and PL lens mounts so you can use standard photographic lenses. If you’re building a complete broadcast camera chain, the optional URSA Viewfinder, URSA Studio Viewfinder and SMPTE fiber converters feature familiar controls and design, so they operate exactly as experienced camera operators expect. URSA Broadcast helps you get the most value out of your investment in cameras, lenses and accessories, which means you’ll save time and money, so the camera virtually pays for itself. The broadcast B4 lens mount on URSA Broadcast features high performance cinema quality optics with spherical aberration correction specifically designed to match the camera’s sensor. The â…”” mount lets you use existing HD lenses or Ultra HD lenses. Many high quality HD lenses can be used at resolutions well beyond HD, all the way up to 2.5K or 3K. Because B4 lenses are par-focal and have a very wide depth of field, the image stays in focus as you zoom in and out, so you don't need to chase focus as you shoot. That lets you work much faster because you don’t need to change lenses or refocus between close up, medium and wide shots, which is perfect when you’re following the action in fast paced sport. You also get full electronic B4 lens control so you can adjust the focus, iris and zoom using the camera’s controls, or remotely from an ATEM switcher using the SDI camera control protocol. URSA Broadcast features an incredible 4K image sensor and a new extended video mode with better dynamic range and colour fidelity. The image sensor is designed for both HD and Ultra HD so you get amazing texture and detail, accurate skin tones, vibrant colour and high dynamic range video, all without the need for post production. That means you can shoot, edit and get stories on air fast. The high resolution sensor is a huge advantage, even when working in HD, because you get sub pixel image processing and superior anti-aliasing for super sharp images. URSA Broadcast is a future proof camera that’s versatile enough to use on any HD or Ultra HD production. URSA Broadcast features high quality neutral density (ND) filters that let you quickly reduce the amount of light entering the camera. The ¼, 1/16th and 1/64th stop filters have been specifically designed to match the image sensor and colour science of URSA Broadcast, providing you with additional latitude and better colourimetry, even under harsh lighting conditions. This lets you use different combinations of aperture and shutter angle, in a wider range of situations. The IR filters have been designed to evenly filter both optical and IR wavelengths. This eliminates the IR contamination usually associated with most ND filters. The ND filters are true optical filters with a precision mechanism that quickly moves them into place when the ND filter dial is turned. The filter settings can be displayed as either a fraction, number, or stop reduction on the LCD. URSA Broadcast features both dual CFast 2.0 recorders and dual SD/UHS-II card recorders so you can choose the media that works best for you. Both types of media are standard, non-proprietary, inexpensive and readily available at most computer and camera stores. You can record 10-bit broadcast quality DNxHD 145, DNxHD 220X or ProRes files with metadata, making URSA Broadcast compatible with virtually all editing software. That means URSA Broadcast is easy to integrate and fit in to your existing broadcast systems. You can even record lossless 12-bit CinemaDNG RAW files for high quality programming and post production workflows. With dual slots for each media type, URSA Broadcast gives you redundant recorders and non stop recording. When the first card is full, recording automatically continues onto the next card so you can swap one card while recording continues on the other. URSA Broadcast features a super strong, lightweight magnesium alloy body that’s perfectly balanced and designed to be comfortable enough for all day use. Like traditional broadcast cameras, it features familiar externally mounted mechanical switches and controls that give you direct access to the most important camera settings. The controls are laid out logically, making them easy to remember and locate by feel, so you can adjust settings without having to look at the buttons or take the camera off your shoulder. You also get a 4” foldout touchscreen for monitoring, or controlling the camera via a revolutionary software interface that provides full redundancy for all of the external controls and camera functions. There are even redundant controls for the power switch. URSA Broadcast also includes full size standard connections for audio via XLR connectors, SDI via BNC connectors and broadcast power input via a standard 4 pin XLR 12V DC connector. See critical shooting information in bright daylight. The status display is a high visibility LCD screen that’s designed to be easily seen, even in bright light. The status display shows record timecode, locked timecode and reference timecode, along with the current shooting frame rate, shutter angle, aperture, white balance, gain and iris. It also features a battery indicator, card recording status and audio meters for monitoring levels. The screen’s backlight can be turned on when you’re shooting in dimly lit locations, and off when you’re shooting outdoors and in bright light to increase contrast, making it easy to read under any condition. Capture fast action with smooth flowing slow motion. URSA Broadcast has a high quality microphone and professional audio recorder built in so you don’t have to carry any extra sound equipment. The built in stereo microphone can be used for recording or you can connect professional microphones using the two XLR mic inputs. The XLR connections have 48V of switchable phantom power so you can plug in everything from shotgun to wireless clip on mics. With two microphone inputs, you can record a reporter in the field wearing a lapel or handheld mic, while also capturing ambient sounds from the second input. You can also record the same microphone to both channels using different levels to avoid clipping from unexpected loud noises in the field. URSA Broadcast also features external knobs for adjusting levels and onscreen meters so you can trim audio levels even when shoulder mounted. Transform URSA Broadcast into the ultimate studio camera. URSA Broadcast has built in remote control, colour correction, talkback, tally and other features designed to make it the ultimate studio camera for live switched production. It can be remote controlled via SDI using the Blackmagic SDI Camera Control protocol. You can add the optional URSA Studio Viewfinder, Blackmagic Camera Fiber Converter and Studio Fiber Converter to get the exact same workflow and features of studio cameras costing hundreds of thousands of dollars. But best of all, when the live production is complete, you can quickly transform URSA Broadcast back into a normal shooting camera! URSA Broadcast lets you get the most out of your investment in cameras and lenses because you can use it every day out in the field or in the studio. That’s the ultimate in flexibility because every URSA Broadcast camera you own can be used on live programs, allowing you to easily handle very large live jobs with lots of cameras, all without any extra equipment rental costs. Blackmagic URSA Broadcast features the latest technology and connections such as 12G-SDI. All connections use standard broadcast connectors so you don't need expensive, proprietary cables that are hard to find. This means you can get cables from your favorite supplier or even make your own. You get multi rate12G-SDI connections for video output and return program feed input. Both connections automatically switch speed so they work with all HD and Ultra HD formats up to 2160p60 over a single cable. You also get HD-SDI monitoring out, 2 LANC inputs, balanced XLR audio with phantom power, and timecode/reference input. On the front right side of the camera is a 12 pin Hirose connector for broadcast lens control which can both power and control SD, HD and Ultra HD lenses with both analog and digital control. There’s also a 4 pin XLR 12V DC power output and HD-SDI monitor output that can be used with an URSA Viewfinder, URSA Studio Viewfinder, any viewfinder or external monitor you’d like. Compatible with B4, PL, EF and F mount lenses. URSA Broadcast features an interchangeable lens mount so you can easily swap the included B4 lens mount for an EF, PL or even F mount. That means if you’re just starting out you can use low cost, high quality EF photographic lenses and then change to more expensive lenses when you’re ready. Using an EF, PL or F mount lens is a fantastic option when permanently rigging and mounting cameras in locked off positions on set, so you don't tie up broadcast lenses for camera positions without operators. Because the lens mounts are easy to change, you can also quickly reconfigure cameras from job to job. URSA Broadcast comes with a B4 mount already installed, and you can also purchase optional PL, EF and F mounts separately as needed. With URSA Broadcast, you get a single camera that works with virtually all professional lenses so you can choose precisely the lens you need. Advanced operating system and user interface allows access to all camera settings fast. URSA Broadcast features the advanced Blackmagic OS with an intuitive user interface that lets you use simple tap and swipe gestures. Plus, you get many features from the URSA Mini digital film camera if you need to do more advanced programming work. You can set up the camera, enter metadata and more. Plus, the software duplicates all of the physical buttons and switches on the camera so you get full redundancy. The unique heads up display puts commonly used functions at your fingertips so you can tap on a control and quickly make adjustments without having to navigate through complex menus. The digital slate makes entering metadata fast with its built in dictionary, predictive text entry and on screen keyboard. URSA Broadcast includes a 4-pin XLR industry standard power connector that works from 12V to 20V for external power supplies and battery packs. The standard power connector also means it’s easy to use the camera with all of your existing power supplies and batteries. 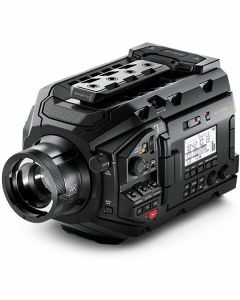 All URSA cameras use the same battery power connector and mounting points on the rear of the camera so you can use a wide range of battery plates from manufacturers such as IDX, Blueshape, Anton Bauer and more. For ease of installation, you can also add the optional Blackmagic URSA VLock Battery Plate or Blackmagic URSA Gold Battery Plate for using popular Vâ€‘Mount and Gold Mount batteries, because they include a power plug that's designed to plug directly into URSA Broadcast. Media Format: Can format cards to ExFAT for Windows and Mac or HFS+ for Mac (file systems). Codecs: DNxHD 220X, DNxHD 145, Apple ProRes 4444 XQ QuickTime, ProRes 4444 QuickTime, ProRes 422 HQ QuickTime, ProRes 422 QuickTime, ProRes 422 LT QuickTime and ProRes 422 Proxy QuickTime, CinemaDNG RAW, CinemaDNG RAW 3:1, CinemaDNG RAW 4:1. External Control: Blackmagic SDI Control Protocol, iPad control via Bluetooth, 2 x 2.5mm LANC for lens and record control. Talkback: SDI Channels 15/16 and iPhone headset. Live Tally Indicator: Tally on LCD, URSA Viewfinder and URSA Studio Viewfinder. Recording Formats: DNxHD 1920x1080 and 1920x1080i with either film, video or extended video dynamic range. Apple ProRes 3840x2160 and 1920x1080 with either film, video or extended video dynamic range. Lossless CinemaDNG RAW, RAW 3:1 and RAW 4:1 with film dynamic range at 3840x2160.